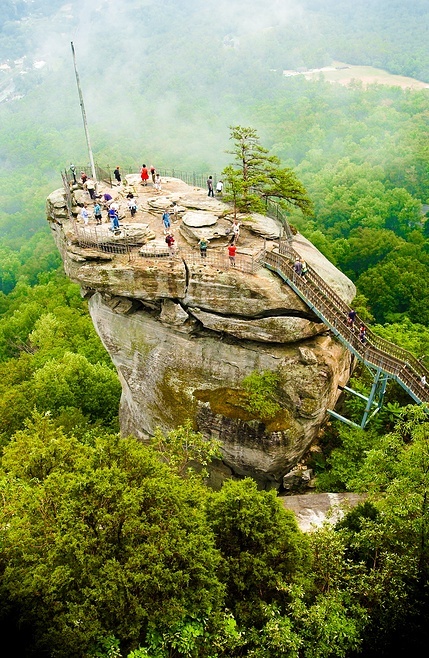 Chimney Rock State Park is a North Carolina state park in Chimney Rock, Rutherford County, North Carolina in the United States. The 5,942-acre (24.05 km2) park is located 25 miles (40 km) southeast of Asheville, North Carolina, and is owned by the state of North Carolina. It offers hiking trails for all skill levels, spectacular views, the Devil's Head balancing rock and a 404-foot (123 m) waterfall, Hickory Nut Falls. Its most notable feature is a 315-foot (96 m) rock formation, a granite monolith, Chimney Rock, accessible by elevator and providing views of the park and surrounding countryside. Areas within the park as well as surrounding the park were featured prominently in the 1984 film A Breed Apart and most of the final scenes of the 1992 adaptation of The Last of the Mohicans, including the Huron negotiation, the chase along the cliff, the fight between Uncas and Magua, Alice's decision, and the climactic fight between Magua and Chingachgook.